See....girls like me, just in that, you know, wronged up way.
. it's worthy of love, it is." " you look like a steak marinated in skank juice"
One more thing.... Sign the Coffee Crisp petition!!! do it now! "Altho i'm a girl~ Men's Pocky chocolate is da only one dat i'll eat...! it's da best ... i'll eat it whenever i'm sad or happy; dat's da only flavour i'll eat...among all sorts of pocky sticks~ Men's Pocky Chocolate Rulz~"
Last night I and friends, made a flan. This picture is the result of our efforts. I can thoroughly say that the flan was gross. I ended up puking at 5am this morning, probably not because of the flan, but I will say that it is because of the flan. 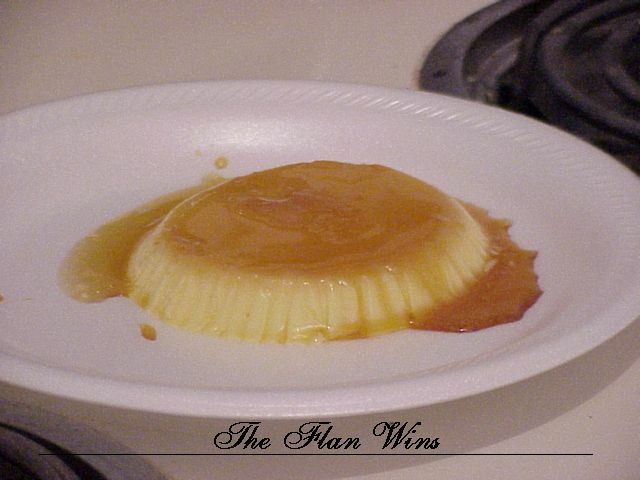 Further proof that the flan wins!